Who can resists zeppoles?! Little bites of fried dough deliciousness. 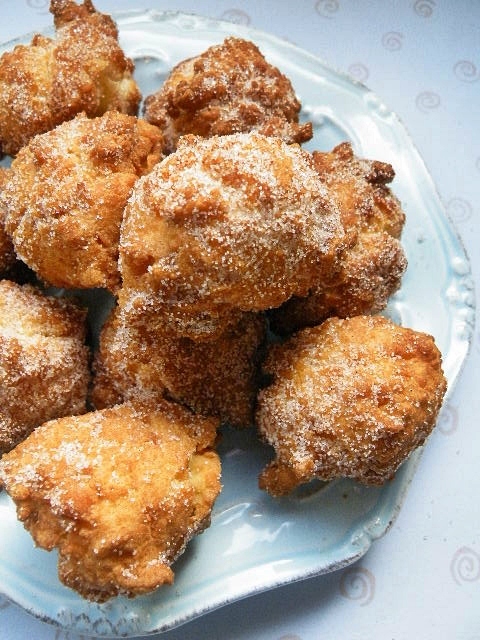 I found a great zeppole recipe that I wanted to share with you! 1 large or 2 medium apples, peeled cored and grated (about 1 ½ cups) – Fuji apples have got to be my favorite apples to bake with/cook with but you can use your favorite apple. Crack the eggs and yolk into a liquid measuring cup or pitcher. In a medium sauce pan, combine the oil, coconut milk, ¼ cup sugar, salt and ground cinnamon and bring just to a boil over medium heat. Stir to try and incorporate the oil into the coconut milk. As soon as the mixture comes to a boil turn the heat down to medium-low and dump in the sweet rice flour all at once. Stir quickly and in one direction with a wooden spoon. The liquid will start absorbing the flour and will form into a ball. Continue cooking and stirring for 1 or 2 minutes. You will see that some of the oil is separating out from the dough, don’t worry. That is ok. Dump the dough (separated oil and all) into the bowl of a standing mixer fitted with a paddle attachment and beat the dough for about 1 minute on medium speed to cool it off slightly. Add the eggs, one at a time, mixing until each egg is fully incorporated before adding the next. Continue mixing until the dough is uniformly smooth, thick and shinny, about 3 – 5 minutes. Stir in the grated apple. Line a plate with paper towels. Heat about 1 ½ inches of oil in a large skillet or Dutch oven to 325 degrees. Drop the dough into the hot oil using a small ice cream scoop or two spoons, about 1 tablespoon of dough per zeppole. Do not over crowd the oil, depending on the size of your pan only fry about 6 at a time to keep the oil temperature even. Turn the zeppole over in the hot oil a few times with a slotted spoon for even browning. Fry for about 4 minutes or until puffed and golden brown. Remove zeppole to paper towel lined plate with slotted spoon to drain while finishing the rest. Sprinkle generously with the cinnamon sugar and powdered sugar and serve immediately. Kwegyirba Croffie is a freelance Associate Producer at News 12 Connecticut and a Special Events/Event Planning and Social Media Intern at College Lifestyles (TM). She is a Quinnipiac University alumni and a sister of Alpha Delta Pi. She enjoy cupcakes,Broadway musicals, Forever 21 ,giraffes, peacock feathers, orchids, lillies and anything Disney. Hello Spring! A sangria is one of the best springtime/summertime drinks! The basil gives this drink that little extra something! Trim and thinly slice the strawberries. Slice and dice the apple into very small bits. Score the basil leaves with a fork. Simply just rub the basil leaves gently with a fork in order to release their flavor in the sangria. 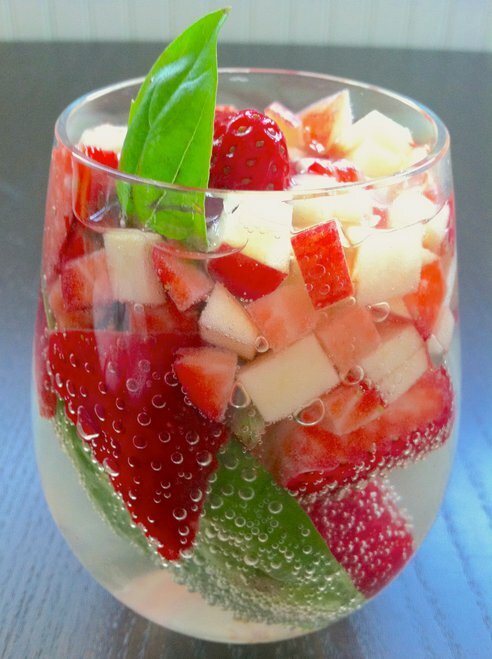 Layer the fruit, sugar and basil in a large pitcher and let sit for about 10 minutes. This is just to let the sugar absorb the juices from the basil and the fruit. You’ll see it turn a bit red. Add the club soda first and then the remaining liquids. Stir well and serve. Found this great infograph on Pinterest and I had to share! 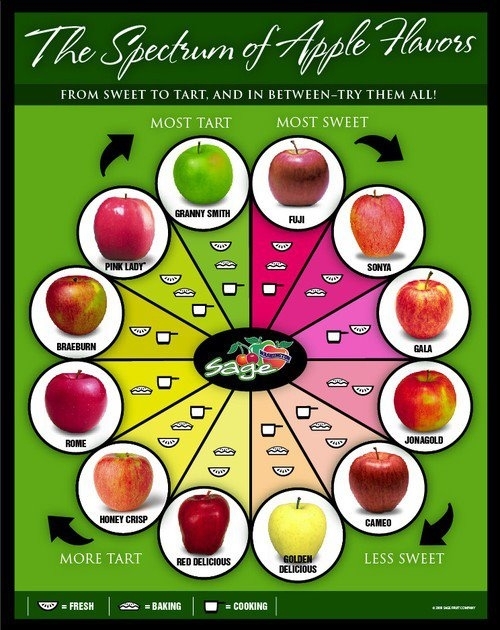 Wondering which apples are best for cooking and baking? This is perfect for you! 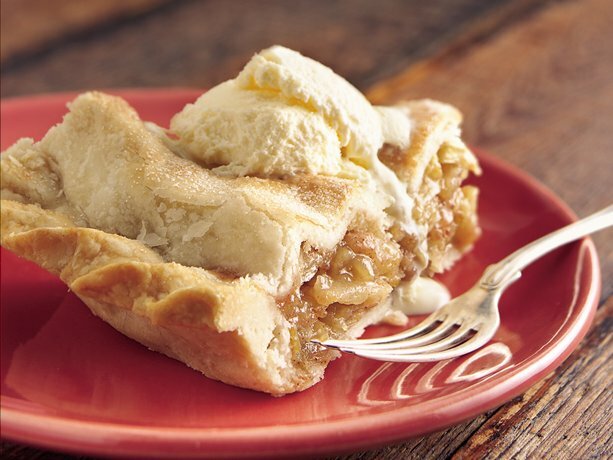 A sugar-kissed apple pie is the PERFECT first pie recipe on this Pi(e) Day! Let’s get right to it! Heat oven to 425°F. In medium bowl, mix 2 cups flour and 1 teaspoon salt. Cut in shortening, using pastry blender (or pulling 2 table knives through ingredients in opposite directions), until particles are size of small peas. Sprinkle with cold water, 1 tablespoon at a time, tossing with fork until all flour is moistened and pastry almost cleans side of bowl (1 to 2 teaspoons more water can be added if necessary). Gather pastry into a ball. Divide pastry in half; shape each half into flattened round on lightly floured surface. Wrap flattened rounds of pastry in plastic wrap; refrigerate about 45 minutes or until firm and cold, yet pliable. On lightly floured surface, roll 1 round of pastry into circle 2 inches larger than upside-down 9-inch glass pie plate, using floured rolling pin. Fold pastry into fourths; place in pie plate. Unfold and ease into plate, pressing firmly against bottom and side. In large bowl, mix 1/2 cup sugar,1/4 cup brown sugar, 1/4 cup flour, the cinnamon, nutmeg and dash of salt. Stir in apples. Spoon into pastry-lined pie plate. Cut butter into small pieces; sprinkle over apples. Trim overhanging edge of bottom pastry 1/2 inch from rim of plate. Roll other round of pastry. Fold pastry into fourths and cut slits so steam can escape; place over filling and unfold. Trim overhanging edge of top pastry 1 inch from rim of plate. Fold and roll top edge under lower edge, pressing on rim to seal; flute. Brush top crust with 1 tablespoon water; sprinkle with 1 tablespoon sugar. Cover edge with 2- to 3-inch strip of foil to prevent excessive browning; remove foil during last 15 minutes of baking. Bake 40 to 50 minutes or until crust is golden brown and juice begins to bubble through slits in crust. Cool on cooling rack at least 2 hours. mmmm classic apple pie slightly kissed with sugar. Delicious, simple and definitely my favorite pie! 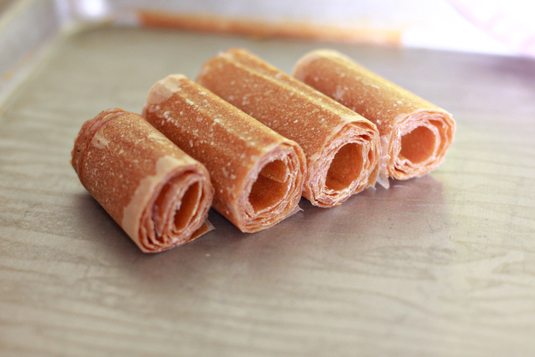 These fruit roll ups take EIGHT hours to “bake” SO it is best to start this recipe early in the morning! It is well worth the eight hours of baking really low. In a medium to large stockpot add diced apples and water. Bring to a boil. Add in lemon juice. Reduce heat to medium-low and simmer until apples start to turn to sauce and can be mashed easily with a fork. Using an immersion blender (or cooling slightly and using a regular blender or food processor) blend until smooth. Add in pumpkin purée, honey, cinnamon, nutmeg and allspice. Continue cooking for an additional 5 minutes to let the flavors meld. Line a baking sheet with parchment or a silicon mat. Spread the purée 1/8″ to a 1/4″ thick on top of the lined sheet. Shake the pan to even things out. Bake at 150° F for approximately 8 hours until purée no longer feels gummy (it will still have a sticky quality and be pliable). Allow to cool slightly. Roll fruit and parchment backing into a long tube. Cut into portions. If you used a silicon mat, transfer fruit to plastic wrap before rolling. Store in airtight containers or zip-top bags until ready to eat. Here is another great recipe using my all time favorite fruit, the apple! This treat is delicious and full of flavor! It’s like a rustic apple individual apple tart. 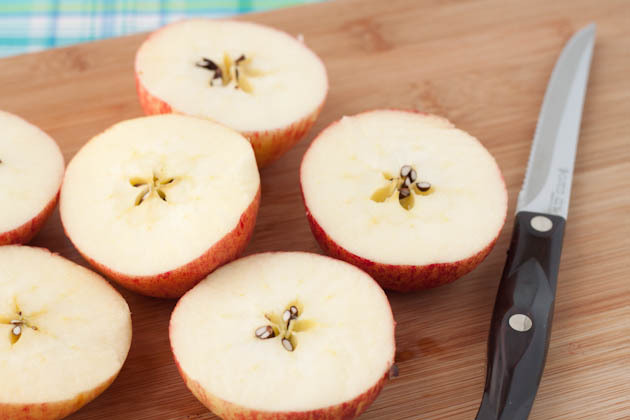 Cut apples in half and remove core and seeds with a small pairing knife or spoon. In a small bowl combine margarine, brown sugar, gluten free flour, oats and cinnamon. Spoon on top of the apple halves and sprinkle with cinnamon. Place on a cookie sheet and bake in the oven for 30 minutes. Serve warm with fat free whipped cream or low fat ice cream. Or enjoy all by themselves! Kwegyirba Croffie is a freelance Associate Producer at News 12 Connecticut and a Special Events/Event Planning and Social Media Intern at College Lifestyles (TM). She is a Quinnipiac University alumni and a member of Alpha Delta Pi. She enjoy cupcakes,Broadway musicals, Forever 21 ,giraffes, peacock feathers, orchids, lillies and anything Disney. You can either cook this on the stove-top or the microwave. Combine all the dip ingredients in a small pan/ microwaveable bowl except the cornstarch-water mixture. Put back in the microwave/stove top until boiling and the sauce has thickened. Set aside. You can serve this warm or chilled. 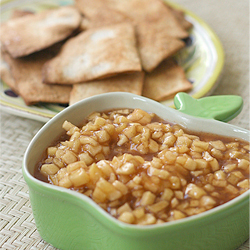 Break out the cinnamon sugar tortilla chips and dip away!